Fall is quickly arriving, and with the changing of the leaves comes many autumnal traditions: the likes of tailgating, Oktoberfest, and harvest festivals. What do all these fall events have in common? Enjoying beer outside! This is no coincidence: beer tastes better outside. If you're one of those skeptics who prefers a roof over their head and a cushy chair to sit upon when enjoying their seasonal brews, get ready to be proven wrong. World-renowned beer judges (and anyone else who's ever had a cold one before) know how important smell is to the taste of a quality beer. Drinking beer outside eliminates those stale bar aromas that quash the taste of your brew. Take a deep breath of pure forest air, then take a sniff of your freshly poured ale. Is that delicious piney smell your beer or the actual pine behind you? Both! Now stop sniffing and start sipping. Another downside of pubs and bars: they're warm. The ideal beer temperature depends on the type of beer, but hovers around 35° - 50° F. Toasty warm breweries and restaurants heat up your beer, making it lose its crisp flavor. But a fall evening breeze in fresh mountain air will keep your drink chilled for hours (especially in a Glacier Stainless Tumbler). Put on your flannel and grab a blanket and enjoy your beer that's literally as cold as the [insert mountain range you're nestled in]. There are about 140 calories in a 12oz beer, and the heavier the beer, the heavier the calorie count. No need to count those calories, though, if you earned your beer with a jaunt in the great outdoors - with a hike, swim, paddle, bike ride, or perhaps a cartwheel or two. No more light beer for you! Beer (in healthy moderation) reduces stress and releases endorphins. You know what else reduces stress and releases endorphins? Being outside! No crowds, no grumpy bartenders, no strangers spilling drinks in your general vicinity. 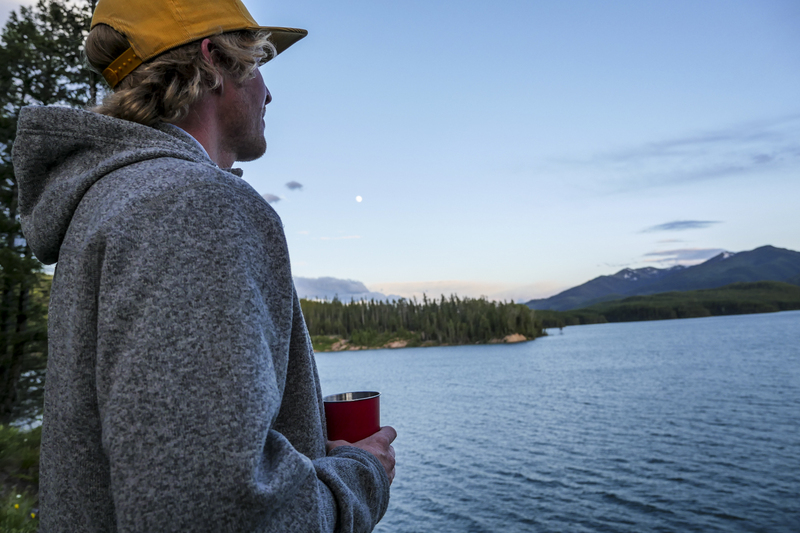 Beer + the great outdoors = total relaxation. When you BYOB and BYOCup, nobody cares what's in your pint glass. Did that quadruple hopped IPA cost thirteen dollars? Do you prefer grapefruit shandies but you have dark-beer-only friends? Nobody has to know. Drink what makes you happy without the judging eyes of bargoers or snobby servers. The only reason you'll be shamed for drinking beer in the woods is if you leave your trash behind - so remember to use reusable drinkware and carry out all your cans and bottles without leaving a trace. Now you've been convinced, what are you waiting for? Grab your pint and get out!